Once upon a time, giants roamed the sky. They did so not in the misty past but for several decades of the twentieth century, starting just about at the turn of the century, and ending with the explosion of the Hindenburg in 1937. Even the Goodyear Blimp has a majestic stateliness to it, sheer bigness that distinguishes it from all heavier-than-air craft. Yet it was dwarfed by the great zeppelins. The Hindenburg over four times as long and twice the diameter - giving it just about 20 times the volume of a Goodyear Blimp - 20 times the bigness. Sometimes size really does matter, and it matters for airships. I am sorry I never got to see a vehicle 800 feet long gliding across the sky, its shadow wrapping the hillsides below. Dirigibles (technically rigid dirigibles) have a mystique of their own, having simultaneously the worst of reputation and the greatest of fascination. The Hindenburg not only has been remembered as a flying Titanic, it has made all airships Titanics - gigantic gas bags waiting for a lightning bolt. At the same time, dirigibles or zeppelins are endlessly popular in alternate history and kindred branches of Romance - so much so as to be something of a cliché at places like alternatehistory.com. Airships are genteel in other ways as well. Airship travel must have come as close to the pace and grace of train travel as air travel can get. Who would not want to escape from our world, with its technological marvels such as a Greyhound bus with wings, to a world where you relax in the gondola lounge, an inverted Domeliner, as the landscape glides past below, close enough to see the cows on the hillsides. Even battles between airships are imagined as having something of the pace and flavor of battles between sailing frigates. In fact, airships evoke a more genteel world altogether. On a darker note, not infrequently the airship world is conservative and technologically sluggish, as in Kingsley Amis' The Alteration. I want to focus not on the gentility of airships, however, but their place on a continuum with aether ships. So maybe I should first do something I failed to do last post: define an aether ship. They are, as I understand them, largely a retro-SF invention, with antecedents in the "scientific romances" of a hundred years ago, but no defined canonical form until I write the next paragraph. An aether ship is a Victorian or Edwardian spaceship, propelled by a drive that probably though not necessarily interacts with a pervasive cosmic aether. Unlike most later starships, aether ships in general can also travel in an atmosphere and land on a planet (possibly on water) in spite of its great size. An aether ship in fact is probably about the size and shape of a dirigible, and its behavior in atmospheric flight would be rather similar. It might differ in being roughly a thousand times heavier - the mass of a seagoing ship - but these are technical details that have little to do with the image or magic that airships and aether ships share. Extented into the past, aether ships become more fantastic, ultimately the airborne galleons of graphic fiction, though even these may have a whiff of proto-science science to them. (Is astrology a fantasy element, or a retro-SF element?) Going in the other direction? One reason that no aether ships are dreadnoughts is that they all become obsolete the year before HMS Dreadnought was launched - in 1905, when a postal clerk in Switzerland demonstrated that the cosmic aether they were supposed to impel themselves through did not exist. 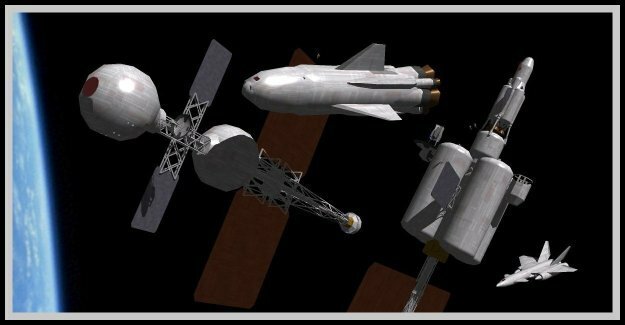 After that, aether ships became by degrees ordinary spaceships - a Russian schoolteacher having figured out the basic features of all present day spacecraft and then a bit. In fact, an aether ship is pretty much how most people still imagine spaceships, and certainly the way Hollywood does, minus the Belle Epoque stylistic elements. Even we hard SF geeks must make a conscious effort not to see our ships as flying on one side like sea craft or aircraft. Part of the charm of airships is that you can very nearly heave your cake and eat it too - fill the sky with thousand-foot ships, without requiring any fanciful physics, at most a bit of semi-fanciful engineering. After all, if no thousand-foot zeppelins ever flew, the 804-foot Hindenburg did, even if its voyage ended like the Titanic's. In real history, the airship was not so much killed as it never quite gained enough lift. The future of airships looked pretty bright after the First World War. German zeppelins had bombed London, only a nuisance value at the time though a grim foretaste of total war. More substantively they were the eyes of the High Seas Fleet. Britain and the US were both interested in naval airships for long range reconnaissance - an application that, if pursued, would find solutions for most of the technical requirements of transatlantic commercial airship service. In Britain the program fell victim to interservice rivalry (the Royal Navy was interested in airships, but the RAF was not) and postwar retrenchment. In the US the program muddled along for some years, and the US Navy built a few big airships, but the first - USS Shenandoah, 680 feet long and only 35 tons - was lost to a needless breakup in a storm in 1925, and the even larger USS Akron, 785 feet long and 100 tons, was lost at sea with almost her entire crew. The crash was survivable, as crashes of helium airships frequently were, since even if they break up the gasbag sections tend to drift rather than plummet to earth - but the crew had not been issued life jackets. Lost with her was Real Admiral Moffett, the Navy's leading champion of airships, a further blow to the program. When her sister ship USS Macon also crashed at sea in 1935, all but two of the crew survived. Of the big US airships, only the ex-German zeppelin USS Los Angeles ended its career in one piece. Loss of four out of its five airships in peacetime operation is enough to explain why the US gave up on dirigibles. All of the losses seem to have been avoidable. Taken together they raise the question of whether any structure as large and lightweight as a dirigible could be built strong enough, with 1920s and 1930s technology, to stand up to violent weather. On the other side, the Zeppelin company operated commercial service safely for years, suggesting that airships could be safe in the hands of those who respected their limits. The skies will not be filled with airships, any more than the seas are filled with battlecruisers or ocean liners. Even at their height, only a couple of dozen might be in service worldwide, but they would make their mark as the embodiment of luxury travel. A fair comparison to the role of more successful airships might be flying boats, another technology that flowered in this era. Only a handful of Pan Am's China Clippers were built, and they only flew in commercial service for short time, but they were and are an air travel legend. In World War II they would serve for the most in unsung but critical roles, as Atlantic convoy escorts and Pacific long range patrol craft. Is there any justification for an early radar apparatus that is too large for a plane, but not too heavy for a zeppelin? If so, airships in the Pacific might have served in an AWACS-like role. Like giant flying boats, the great airships would not long outlast the war. The transatlantic airliner would muscle them aside, and the postwar generation - technical marvels utilizing wartime progress in airframe structures and materials - would end up in a few years as specialized cargo carriers, or as scrap, though smaller blimp types might remain in more widespread use than in our world. The abiding temptation of airship fantasies, in my modest opinion, is asking too much of them - filling the sky with zeppelins doing the impossible, instead of accepting them as rare giants of the sky, purple argosies dropping down with costly bales. Their time would still have come and gone, but what a wonderful way to fly. Are Aether Ships Ever Dreadnoughts? A peculiar thing happened to keep me from updating this blog over the past few weeks. I created a universe. I claim no special achievement in having done so; for fiction writers - especially in most branches of the great super-genre of Romance - creating universes is both part of the job and a seductive occupational hazard. This is not limited to people who write fiction, whether or not intended for publication. A universe is created every time a middle-school girl draws a superheroine catgirl and gives her a name and origin story; every time a bored graduate student uses SpringStyle to sim a predreadnought battleship, then gives her a name, country, and service history. Universes can be made to order - no particular inspiration from the Muse is required - but they can also just happen one day. Is this a problem for God? Has any theology ever proposed that He created this Universe inadvertently, perhaps while he was stuck on where to go next with his high-fantasy trilogy? If you are a writer, don't tell me that you haven't thought about the God analogy. How often do you kill off an appealing character, not because they deserve it, but because by jabbing the reader it helps to move the plot along? As seen from within the created world, this must fall somewhat short of moral justice. Our characters have absolutely no reason to like us, and less to trust us. By and large I suspect we treat our universes better than our characters - we may smash a bit of the scenary now and then, but the sets are big and expensive, and we usually have a notion to use it for more than one production. A universe may not even have a production scheduled, but function more like a mental theme park, a place to wonder around and see the sights. Add dice and you have an RPG. Still, as universes go a trolley universe can be fairly small; mine was originally tucked along the California coast as the mid-sized city of Santa Teresa. Mystery fans will know this burg as a doppelganger of Santa Barbara in Ross Macdonald and Sue Grafton novels. Mine is farther north and larger - large enough for a rail transit line to survive the decimation of the 1940s and 1950s. Railroad empires, however, tend to be imperial, especially when you don't actually need to build them. I started wondering about a mainline railroad at the turn of the last century. How many locomotives and cars does it need? How much freight do those freight trains haul, and how many people are needed along the line to produce and consume that much freight? Statistics have their place in Romance, or at any rate in world-building. But it cannot all be statistics, or even way freights chuffing along the line. To be Really Cool our railroad must have an express that takes a day and a night, or close to, to run its schedule - long enough for dinner in the diner, an evening flirting in the parlor car, and of course the pleasures of a sleeping car. Bending history a bit, we give our turn-of-the-century express train some streamliner-era amenities like roomettes instead of open Pullman compartments. But we must have 700 miles of line, give or take, for the Hidalgo to run along. British readers will say that many a memorable train ride has been had in half that distance, but I grew up in the American West, and we need big planets to colonize. Thus our rail empire must serve a region at least the size of California - not just one city and its surrounds. So let's make California an island, as it was once imagined to be. * The geography won't be the same, but similar, and we'll put it off the coast of a truncated North America, doing the Atlantis thing with much of Nevada and southern Oregon. No one will really miss them. Anticipating future posts, some of you will note that the issues of statistics and scale that apply to our railroad world are very closely akin to those of planetary colonization - how many people in our colony, how much do they need as imports, and how much do they produce for export? Too much SF has gigantic star-freighters serving outpost worlds whose demand can't fill a 20-meter cargo pod. Here is the inevitable, necessary link to Atomic Rockets. Ahem, back to boxcars. Since we've made our railroad empire an island, why not an independent country? Now we're moving past railroads, into a larger world. Still a pretty geeky one, because the next thing to do is give our country a few battleships. It's the early 20th century, and battleships are in. Everyone wants to be the first in their bloc to have one. Here is where all too many imaginary countries go awry, because the temptation is always to give your country the most humongous battleships ever, battleships that make the Yamato look like a pokey gunboat. But our railroad empire has about the population of California in 1900 - a million and a half people, 2 percent of the real world US population at that time. If Teddy Roosevelt couldn't build the world's biggest battleship, our country certainly won't. Maybe they can build a few miniature battleships, like the Scandinavians and Dutch did. Those countries were surrounded by bad tempered Great Powers, but in the Pacific, in 1900, a couple of 4000-ton ships with a pair of 8-inch guns each are something to reckon with. Admiral Dewey got American imperialism off to a rollicking start in the Philippines in 1898 with not much more than that. Now our railroad empire is turning into a real country, and it's time to give it a name: the Republic of Santa Catalina. It thus neatly gives a nod to the protagonist of my long-suffering novel, evokes real Catalina Island, "26 miles across the sea," and has the right rhythm - don't you wish they all could be Catalina girls? We'll need to jigger some history to cover our aspect. If the US stretches from sea to shining sea, an island off the Utah coast will be hard put to stay independent. So we need to change some history as well as geography. The usual way to slow down US expansion, or at any rate overturn the chessboard, is for the South to win the Civil War. But that has been done to death, and too many ghosts walk unburied. What does that St. Andrew's Cross mean - Stonewall and Lee; bullwhips and white hoods; both? Happily a name drifts into mind: l'Empire de la Louisiane. It's only a name, but it evokes a slightly dark magic, warm evenings and demoiselles with flashing eyes. That's something to work with! Details to be filled in, but somehow the Louisiana Purchase never happens, and Louisiana is an independent, francophone country. It has charm, and poor heartbroken New Orleans deserves a break if only in fantasy. Santa Catalina and its world may not exist, but we can see it: The Gilded Age mansions and swanky hotels in the capital, El Dorado, due for a shaking up one of these years. The ladies with their parasols, the workmen with their caps and radical pamphlets stuck in their pockets. The painted ladies - El Dorado, like its doppelganger, is a wide open town, a sailors' town, because the world's world's shipping is in the port along with those mini-battleships. Around 1905 or so the battleships are transformed in a profound, subtle, and sinister way. They had been painted in handsome white, buff, and black, like Queen Victoria's ships, or old Currier & Ives prints of the Great White Fleet. Then, overnight, they turn gray - goodbye Currier & Ives, hello to warships as we know them, gray shadows racing through the mist and fog - or turning turtle like dying sea monsters as desperate men scramble across their hulls. At about the same time, the world's soldiers turn in their marching-band uniforms for businesslike khaki. Even in the worlds of fantasy, grim realities intrude. The ladies with their parasols, strolling with their beaux along the Embarcadero, scarcely notice that the battleships have turned gray. Even less do they notice an experimental submarine slipping beneath the waves. Yet somewhere, in a few years, an archduke will be shot, or maybe this time a crown prince, and all hell will break loose. External realities also intrude. Now that I have a world, what exactly do I do with it? Alternate history is big just now, but the thud and blunder variety, at least, leans very heavily on Top 40 history, such as the US Civil War and World War II. Little place there for an oddball pseudo-California in the Electric Age. In any case, my world is not strict Alternate History in the sense of deviating from real history at some given event - the thinking geek's version of "What if Napoleon had a B-52 at the Battle of Waterloo." Only in the meta-realm of all possible worlds can an Earth with a different geological history going back millions of years bring forth human, let alone a recognizable history. Too many butterflies will have fluttered their wings. Social alternate history - if there is such a subgenre - would probably be more fluid. There's a large readership out there, I suspect, that can't get enough of the social world of the Belle Epoque, people on the edge of modernity. The hitch is that you have to know your stuff, and not just the difference between pre-dreadnoughts and dreadnoughts. The potential readership, probably mostly female, does know their stuff (including dreadnoughts), and they will send the book flying at the first false note. All I know about the era, except for its cool gismos, is Thorstein Veblen, My Fair Lady, and Gigi. If I made the gizmos even cooler, I could maybe peddle it as steampunk. Steampunk, which inspired the name of this blog, is the ultimate retro SF: people in 2007 re-imagining science fiction - or Scientific Romance, as it then was called - as people around 1880-1900 might have written it, if they had written more of it, and knew what Scientific Romance would become. The era around 1900 was the real Singularity, when everything changed. And a world that till around 1870 was not essentially different from the Middle Ages became, by 1929, essentially the world we know. As home entertainment goes, the difference between harmonica and scratchy phonograph is vastly greater than the difference between phonograph and DVD playing on an 80 inch flat screen. For my grandmother, growing up in Mississippi early last century, the idea of travel to the Moon must have been more astonishing by far than interstellar travel is now, but she sat on the couch beside me when Armstrong climbed down the ladder onto a different world. By and large it's been good. 90 percent of the world's people are no longer peasants, and famine strikes at the world's margins, not at the heart of China and India. The war part hasn't been so great. People knew before Homer that war was a senseless tragedy, and before the Old Testament that it was evil, but until the Singularity it really was the straggler of the Horsemen, not mowing down a tithe of what the others carried off. With the Singularity we have gotten a hand on the others, for now - the stability of the Earth's ocean-atmosphere system permitting - but the fourth horseman got wings, then superchargers, then bombs containing physics packages, and we pretty narrowly dodged a bullet. Part of the charm of steampunk, I believe, is that the aether ships are all pre-dreadnoughts, and they are not yet painted gray. * A charming insular alt-California can be found here - and with a trolley theme, no less.